We would like to invite you to attend this year's Blazer Baseball Summer Showcase. This showcase is for top high school players, who are serious about their future in collegiate play. This is your opportunity to display your talent in front of the VU Baseball coaching staff. *The showcase is limited to the first 64 players. NOTE: No Refunds. If for some reason you are not able to attend or weather causes us to cancel you will receive credit towards a future showcase. The Showcase will be all-day event. Coaching staff will use the following schedule for the showcase: All times are EDT. All participants should bring cleats, a glove, a hat and baseball pants. Catchers should bring their own equipment. Each participant will receive a free VU T-shirt. VINCNENES, Ind. 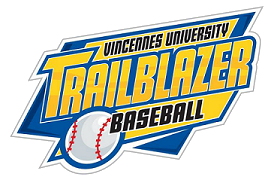 -- The Vincennes University Baseball Team will be hosting a youth camp for ages 6-13, on Saturday, Dec. 8, 2018. This will be a great opportunity for children to be under the tutelage of the Trailblazer Baseball coaching staff. We will cover all aspects of the game; hitting, pitching and defense. This will be an all day event from 9:30am till 2:30pm in the afternoon. The camp will include a pizza party for lunch, and also a camp T-shirt. The camp will be held in Beless Gym on the campus of Vincennes University on the corner of Indianapolis and Chestnut Streets. Early Registration is open till Friday, Nov. 30 and cost is $55.00. After Nov. 30, the price is $60.00. Additional discounts will be given for families sending more than one sibling, contact Coach Barney for more information. 2:30- Conclude camp and Hand out T-SHIRTS. All players will need to bring their own equipment marked with their names on them. The undersigned (parent or guardian, if under 18 years of age) understands that the applicant will be engaging in physical activity during the camp which contains an inherent risk of physical injury and the undersigns releases and hold harmless Vincennes University, its officers, trustees, agents, employees, including all who are working the camp, from any and all liability whatever kind or nature, from personal injury or property damage arising out of the applicants participation in the camp. I know of no reason for my child not to participate in the camp. I hereby grant permission for my child to be treated by a licensed physician or member of the staff in the event of an injury, illness, or mishap and shall not hold liable any listed above for any consequences from such injuries or treatment. I have carefully read all the information in this form and agree to all conditions.